While we know the schism from the comfort of retrospection, those present for its 16th century inception (and long afterward) had the task of sorting out winners and losers on blood-soaked scaffolds. So we pause this date to note the extirpation September 20 and 21 of the Babington Plot, a half-baked scheme to re-establish the Old Faith that turned into one of history’s signature achievements of espionage. Its namesake, young Sir Anthony Babington, was a secret Catholic with more money than sense; like many a Catholic of this time, he bristled under the rule of Elizabeth I, the daughter of the very woman who started all this English Reformation trouble. Besotted with fellow-Catholic Mary Queen of Scots after having served as her page in his youth, Babington was easy prey for the fellow invariably described as Elizabeth’s “spymaster” — Francis Walsingham. Not one for scruples where his own security or his sovereign’s was concerned, Walsingham had long considered Mary Queen of Scots too dangerous to be left alive: every Catholic plot against Elizabeth intended to replace her on the throne with this Catholic cousin. 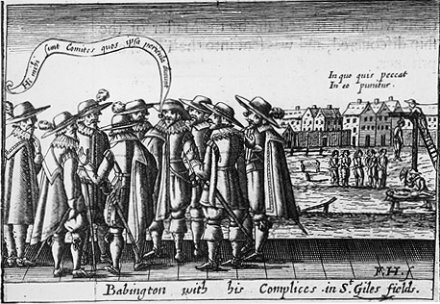 Trying to overcome Elizabeth’s reluctance to off fellow royalty — dangerous precedent, in these dangerous times — Walsingham entrapped Babington and a coterie of other Catholics into designing and documenting a scheme to assassinate Elizabeth and support a Spanish invasion. And most importantly to Walsingham, they got Mary to sign off on it. Though the design was grandiose, the real danger was pretty much nil — since Walsingham, a Renaissance reconnaissance man famous for his continent-spanning intelligence network, had penetrated the circle months before. * Walsingham let the conspiracy ripen long after he had the goods on the likes of Babington, intending to make it the instrument of Mary’s destruction. He succeeded. Coded correspondence that Mary thought she was smuggling in and out of her cell was in fact being intercepted and decrypted. The affair being thus prepared, and forces in readiness both within and without the realm, then shall it be time to set the six gentlemen to work; taking order upon the accomplishment of their design, I may be suddenly transported out of this place. The reckoning for Mary Queen of Scots would not arrive for some months yet. Incidentally, and completely off topic: the subversive, forward-thinking philosopher Giordano Bruno — an Italian who was eventually executed by the Inquisition — has been alleged to be one in Walsingham’s employ. ** Luckily for Elizabeth, the treasonous Protestants who supported her back when she was at the mercy of her Catholic half-sister Mary Tudor were better able to hold their tongues under duress. † One of those executed on September 21, Charles Tilney, has an oblique Shakespeare connection: he’s one possible author of the play Locrine, which Shakespeare might have revised and/or staged; Locrine is in the Shakespeare Apocrypha.